Michael Hawkes helping a child in Uganda. This new development was recorded in Uganda, one of the African countries. No matter how difficult it is for you to believe the reality of this event, children who have been diagnosed for complicated pneumonia have been saved through the provision of oxygen (highly concentrated ones) from an innovated oxygen (solar powered) delivery mechanism. This is a welcome development for Africans and their hospitals considering the numerous challenges facing them as developing nations. This innovation was brought to reality by one Dr. Hawkes (Associate professor) of the University of Alberta. 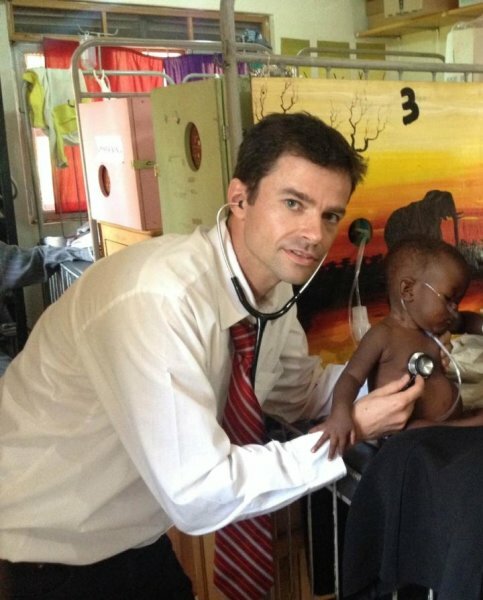 As a pediatrician working in the department of PID (Pediatric Infectious Diseases) of the university, it has been his desire to rescue infected children from death, and the device is already being used in about 2 hospitals within Uganda. Since it is solar-powered, it uses the natural resources of the air and sun. This is harnessed to treat children suffering from pneumonia illness in remote environments. This doctor has helped to fill clinical gaps and save the lives of children in these remote areas. This is a satisfactory discovery for both the researcher and the people enjoying it. It is an indication that we have a lot of natural resources that we can tap into to benefit our environment. The answer is research. Various studies have confirmed that several number of children (approximately 900,000) die from pneumonia on yearly basis. While this is on a global scale, the percentage is higher in developing countries of Asia and Africa. Due to poor diagnostic facilities and unavailability of chest x-rays, death from pneumonia attack is very high in Africa. This does not mean there are no medications and vaccinations for treating this illness, but they are often slowly distributed to these countries. For infected children, there is the need for concentrated oxygen because the disease attacks the lungs. This high concentration of oxygen is needed before any applied antibiotic starts to function due to how it functions in reducing the challenge associated with the exchange of oxygen caused by the lung infection. While this equipment is available by the hospital bedside of most developed countries, this is absolutely difficult to obtain in developing ones. Working in poor communities of Uganda, the innovator has solved the problem of poor power supply needed to power the concentrators of oxygen needed by pneumonia children. Prior to this development, a lot of children diagnosed with these ailments usually die. In absence of regular power supply and even the needed oxygen cylinders, he was able to come up with a solar-generating device. Solar panels were used to supply the needed power directly to a concentrator (oxygen), which collects oxygen from air in the day. In the night, batteries charged using solar panels give the required power to concentrators. This was tested on some children to prove its efficiency. The result indicated that both solar panels and batteries can be used to power the concentrator for 24 hours every day. The system also worked when used in treating diagnosed children. In sum, this system works fine just like the normal oxygen delivery through cylinders.